Yesterday I went to the Magic prerelease for the Dominaria, and had a lot more fun than I expected! Of course, winning a lot will do that. I went to the new Isle of Gamers, which is two doors down from their old location, but is at least 100% improved due to the wider and brighter space. They’ve gone all-in on a pirate theme (which they had before, but it feels more pronounced now), and they have a great-looking private gaming room in back. My approach to sealed deck has been slowly evolving, and these days I tend to focus first on bombs I open and second on number of creatures across the colors, since limited is such a creature-heavy format. It feels like I rarely open pools in which I have more than one viable color pair unless the format supports 3-color decks. 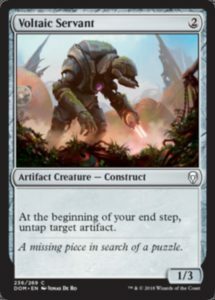 Dominaria certainly does not unless you’re base green, because there is very little color fixing (much like the last time we were in Dominaria, back in Time Spiral), and I think you have to have just the right set of stuff to even consider splashing. 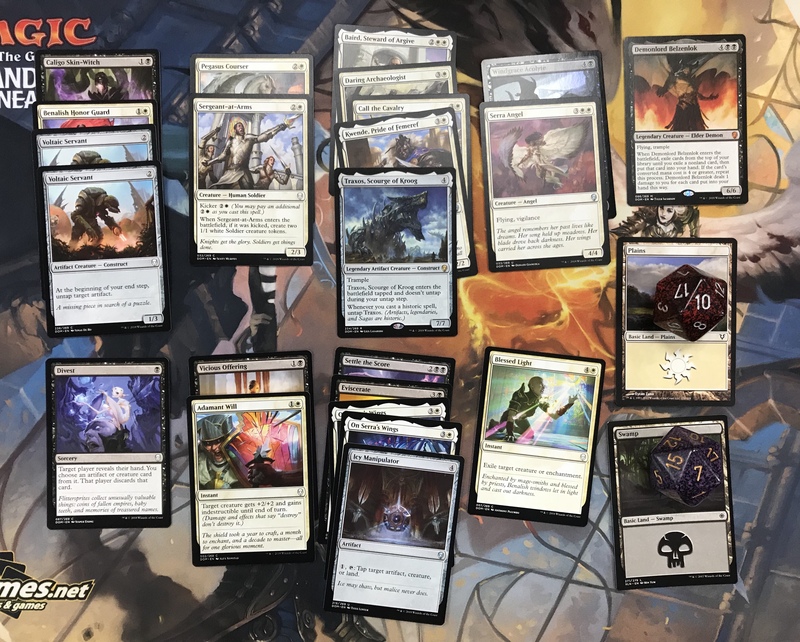 As it turned out I had 4 colors in my pool with nominally enough creatures to build decks – blue being the one that didn’t. Red had some good removal, but the creatures were terrible. At first I as leaning towards black-green, but as I looked at it I felt my green was just not very good and white had a lot more punch. So I ended up going black-white. My main reservation about this deck was its relatively average high converted mana cost and the low-impact 2-drop creatures (3 of them were 1/3s). I also did a test run and realized I had to be mindful of casting Demonlord Belzenlok since I could easily draw a bunch of cards off of him but also lose a bunch of life. My first round was against another WB player. Game 1 I mulliganed to 5 (my first 2 hands had zero lands total), and predictably lost – although if I’d drawn a second Swamp I might have made a go of it. Game 2 my opponent got stuck on 2 lands and quickly conceded. Then, game 3 went on forever and ever. I got out Traxos, put On Serra’s Wings on it, swung twice, and then he killed it. Then we got into a long board stall, I got back Traxos with Daring Archaeologist, he killed it again, and finally I managed to seal the deal with Belzenlok. Second round I faced another WB opponent, but this one went considerably quicker. The second game was a bit of a slog as I kept drawing removal for his good stuff, but I couldn’t get any good stuff of my own. Finally I put On Serra’s Wings on a Voltaic Servant and just kept swinging away with a flyer he couldn’t deal with. Third round I played a red-white deck which looked similar to mine only without as good a top end. I played Divest to lead off game 1 and saw that he had Gideon’s Reproach in hand, but I ended up with more gas than he did and won the first game. The second game we ended up in an early board stall and then I played a Serra Angel. Next turn I had On Serra’s Wings to play and had to decide where to put it. I decided to put it on the Serra Angel in case he had Gideon’s Reproach in hand, making the Angel a 5/5 and out of reach of his spell. His groan when he drew his next card told me that I’d guessed correctly, and I rode the Angel to victory. On to the finals! I played a fellow who had just defeated my friend Subrata at the next table over in the third round. He was playing a black-green go-wide deck based around Saprolings and Slimefoot, the Stowaway. He got Slimefoot out in game 1 and he was as annoying as advertised, but I managed to keep the pressure on with slightly-bigger creatures so that he kept chump-blocking with the tokens, and I finally pulled out the victory with a Serra Angel. Game 2 was epic, and we had several onlookers for the match. He observed that he drew the other half of his deck from the first game, which meant bigger creatures. 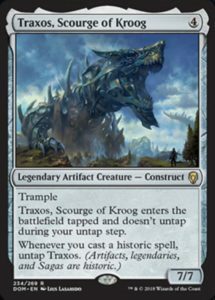 I managed to get out my Traxos/On Serra’s Wings combo, but he dealt with it through removal and a Mammoth Spider. He got a second Mammoth Spider out, but we ended up trading off some creatures and I used removal to bring us – around turn 10 – to the point where neither of us had any nonland permanents on the board. A little more maneuvering resulted in me with a 3/2 flying Windgrace Acolyte on the board, but then he dropped a kicked Baloth Gorger, which put me in a bad place. I’d been drawing a lot more gas than lands, and I started playing creatures to chump his Gorger. He was on 8 life and I was around 13, and I was stuck on 5 lands. Just in time I drew my sixth land and played my kicked Sergeant-at-Arms, which gave me several blockers, and I followed it up with a Serra Angel which ended up being just enough for the win. So I went 4-0 in matches on the day, 8-1 in games, and finished first in the tournament, which was good for 9 prize packs! People have been speculating that Dominaria is going to be a slower limited format, and that’s how it felt yesterday. I rarely felt like I didn’t have time to get down my 4-drops and slow my opponents way down. I’m sure there are a few faster decks in the format, but it feels like there are ways to deal with them. That kind of makes sense in a format with the Kicker mechanic. I’m pretty happy with my deck, though in hindsight I think Divest wasn’t really pulling its weight and I should have replaced it with almost anything else – even just a combat trick. I’m also not impressed with Caligo Skin-Witch, mainly because its kicker cost is too high for what it does and its 1/3 body is unimpressive, but I didn’t have a great choice to replace it with. So I don’t regret playing it, but I think it’s a card to avoid going forward. Overall I was happy with how many redundant moving parts my deck had, so I really didn’t have much trouble slowing down fast starts, dealing with big threats, and getting out my own big threats. Each game played very differently, but my deck was pretty consistent in always having something useful to do. Oh, and On Serra’s Wings is just as awesome as people have been thinking it would be. I’ll definitely have to see how this set plays in draft. I think it will be a lot of “good stuff” decks with minimal synergies, but that can still be fun.